When someone in the San Francisco music community falls on tough times, it doesn’t take long for the Bay Area Band of Brothers and Sisters to step up and do whatever they can to help. Such is the case with Slick Aguilar, Jefferson Starship’s lead guitarist since 1992. At 58 years old, having contracted Hepatitis C, Slick is in critical need of a new liver. Doctors say the prognosis is grim unless he receives a liver transplant very soon. Stepping up to do a benefit concert for Slick at The Great American Music Hall on Sunday, Feb. 24, are Marty Balin–one of the founding members of Jefferson Airplane and Jefferson Starship–and David Crosby, famous for his membership in the iconic group Crosby, Stills, Nash, and sometimes Young. During his illustrious career, Slick performed as lead guitarist with both Balin and Crosby in various groups, and their association turned into a life-long friendship. 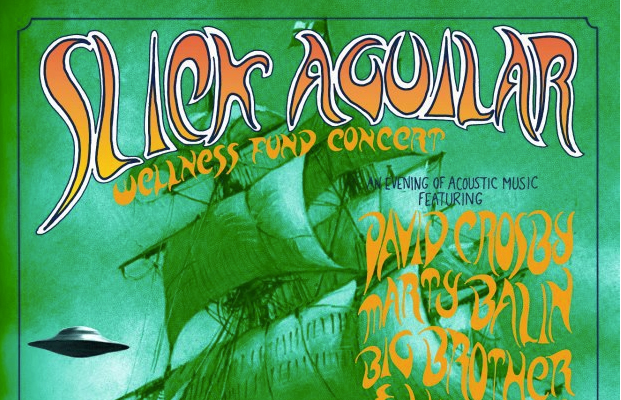 Balin and Crosby will each do an acoustic set at the Aguilar benefit. Also scheduled to appear are members of Big Brother & the Holding Company, and other local musicians performing in various aggregations. Country Joe McDonald will serve as Master of Ceremonies.